Valplast® Flexible Partials are the comfortable and affordable choice. Flexibility, combined with strength and light weight provides total comfort and great looks for any dental patient. Nobody has to know that you're missing teeth! For more than five decades Valplast® flexible partials have been the preferred choice of patients looking for a method of tooth replacement that is aesthetic, comfortable and affordable. Valplast® partials cost less than dental implants and dental bridges and they require no surgery or invasive procedures. 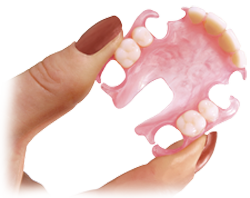 Compared to traditional metal partial dentures, Valplast® offers better aesthetics, comfort and durability. In fact, Valplast® partials are made from an unbreakable nylon resin and each Valplast® restoration comes with a lifetime guarantee against breakage and fracture.